A few weeks ago I heard that new restaurant “Bravissimo” had opened in a newly constructed building just off the smart thoroughfare of Monseñor Rivero in Santa Cruz. I was told by a friend that they served their pizza the way upmarket pizza chains do back home, with freshly ground pepper (very unusual here) and olive oil. I went with my boyfriend to check it out on a Wednesday evening a couple of weeks after it opened. They’ve broadly got three separate menus: a literally huge menu for starters, pizzas, pastas and soft drinks (the menu sheet is bigger than a tabloid newspaper), one for desserts and dessert drinks and finally a wine list. I don’t know if that was by accident or design but in some ways it looked a bit disorganised to have three separate menus (each with a very different design). The pizza selection is amazing and varied, from your standard mozzarella to full seafood, from pique macho to a range of pizzas on a black base (coloured black by squid ink). The prices ranged from about 45Bs to 75Bs (around US$6.50 to US$11). These were pizzas designed to feed ONE (pretty greedy and/ or hungry) person. We ordered a prawn pizza to share and I could tell from the waitress’ expression that this is not what people are supposed to do. The drinks too were relatively expensive – 8Bs for a glass of lemonade and 12Bs for a 500ml bottle of soft drink. We were supplied with a starter of what might have been a type of DIY bruschetta except that they used the standard white bread that you buy in the shops as pan francés (french bread) rather than making their own. Furthermore the loose grated cheese was not parmesan (which can be bought in Santa Cruz). 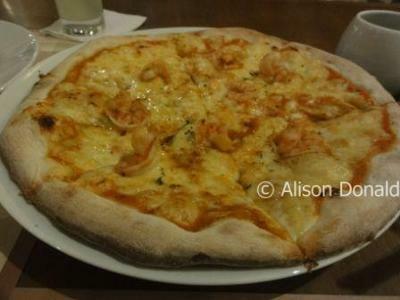 The pizza itself was delicious – the prawns juicy and the cheese just browned. My boyfriend declared the crusts too crunchy and left them for me to eat, which I was happy to do. I can still taste the freshly ground pepper and olive oil, so delicious were they, and enjoyed after such a long break from these flavours. Neither of us were particularly hungry so one pizza between two (and the complimentary starter) was just about sufficient. All the other diners around us ordered one pizza each and did a good job of finishing it. The service was polite and attentive (I am sure at least 3 different people came to serve our table in less than an hour) but a bit nervous and inexperienced. For example when they cleared our plates they didn’t ask us if we wanted to see the dessert menu. Ha! Big fail! I have never been known to turn down pudding so they passed on three dollars there. So our total bill was 90Bs (around US$13) for a pizza and three glasses of lemonade. It was a nice meal, I’m glad I went, and would have no problem recommending this place to a pizza connoisseur. I don’t think it would be my choice to go back there though. I am not fussy enough about pizza to pay twice as much as I would elsewhere. My boyfriend has since informed me that he prefers the pizza you can buy from the local supermarket and cook in the oven at home. Hmmm. It will be interesting to see how this restaurant fares now that the refurbishment of Eli's (pizza and fast food joint almost next door) is complete. On the night we went, Eli's was closed and Bravissimo was around only 1/3 full whilst most of the other restaurants were close to capacity. (Located on Cañada Strongest No. 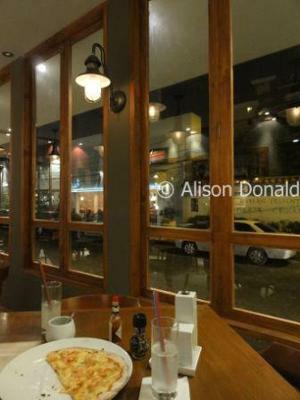 16, just off Avenida Monseñor Rivero, Santa Cruz) Phone: 334-5013. I gotta say i loved bravissimo, theres a special plate they serve with eggplant and Im literally dreaming of it... thanks for the experience! Excelente !!!!!!!!!!! unos ostiones a la parmesana de entradita y despues una pizza negra de mariscos y una ensalada mediterranea. Creo que deben fijarse que sus precios son muy excesivos. Para lo que ofrecen, los precios son excesivos y la calidad es pésima. The better pizza. Nice Trattoria. Still to expensive for a pizza for Bolivia and that is my point of view. I am again speculator! I agree, I like Pizzeria Sahara a lot. Their pizzas are very similar to American pizza. Once I ordered a pizza and it didn't arrive. When the owner found out about that, he called me, apologized, and gave me a free pizza. Nobody does that here but they did. I thought it was very cool of them. I've been ordering from them ever since. For me Sahara or Madre India win, depending on the style of pizza you're looking for!